Once you’re in Port Hardy to catch salmon, you may want to learn more about how salmon stocks are being enhanced to ensure the future of sports fishing. All species of salmon spawn in freshwater streams, migrate to the ocean for part or all of their adult life, and then return to their hatching ground in order to spawn. Most species die after spawning. From Port Hardy you can visit the Quatse River Hatchery, one of four operated by the North Vancouver Island Salmonid Enhancement Agency. The Salmonid Enhancement Agency hatches salmon fry to restore salmon stocks in North Island streams. Tours of the hatchery salmon incubation facilities and its troughs and tanks filled with young salmon are open Monday to Friday from 8:00 am to 4:00 pm. All species of salmon spawn in freshwater streams, migrate to the ocean for part or all of their adult life, and then return to their hatching ground in order to spawn. Most species die after spawning. The return of the hatchery salmon to spawn at Quatse River is best viewed in October when salmon enter the river to spawn. The peak spawning period for Pink Salmon is early to mid October. For Coho Salmon, the peak spawning period is mid to late October. Salmon can be prepared a variety of ways. Once you return home with your catch from your Chad's Coastwide Sport Fishing charter, you'll be able to choose between baking, broiling, pan-frying, deep-frying, poaching or barbecuing your salmon. 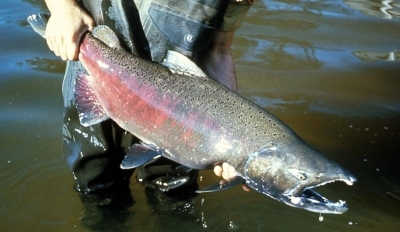 Chinook salmon are the largest of west coast salmon and may reach a weight of more than 30 pounds. Chinook salmon are sometimes called King, Tyee or Spring salmon. Chinook are bluish-green on the back, silver on the sides, and white on the belly but change color when spawning to red-copper or almost black. These salmon migrate to the ocean approximately five months after spawning and live for an average of three years. Chum salmon are also known as Dog or Calico Salmon, because of the changes in their appearance just prior to spawning. Normally a metallic greenish-blue speckled with black, these salmon develop vertical bars of green and purple – the calico effect – and large teeth. Chum salmon live from 3 to 6 years, primarily in the ocean, since they migrate from fresh water to the ocean within a few months of spawning and only return to fresh water to spawn. Average weight is 7 to 18 pounds. Coho salmon have an average weight of 8 to 12 pounds and are often called silver salmon, because they are usually bright silver marked with small black spots on the back and caudel fin. Coho spend 1 to 3 years in streams and up to 5 years in lakes before migrating to the ocean for 6 to 18 months. Pink Salmon, which have an average weight of 3.5 to 5 pounds and are the most numerous species found on the west coast. These salmon migrate from fresh water to the ocean shortly after spawning and spend approximately 18 months in the ocean before returning to spawn in fresh water, usually near where they originally hatched. Pink salmon are sometimes called hunchback salmon, because the male develops a noticeable hump and hooked jaws before spawning. Sockeye salmon, which may weigh between 5 and 15 pounds; spend up to three years in fresh water; and 1 to 4 years in the ocean before returning to fresh water to spawn. The orange flesh of the sockeye salmon has a concentrated flavor which makes it many people’s favorite for eating. To book your salmon fishing adventure, click here.